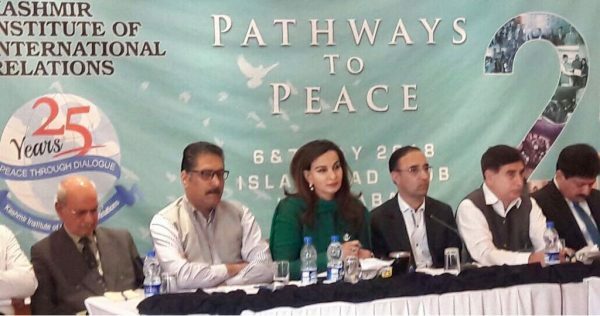 ISLAMABAD, May 7, 2018: Chairing a conference organized by the Kashmir Institute of International Relations (KIIR), Senate Opposition Leader, Senator Sherry Rehman called on the United Nations, international community and the Muslim world to do more for the plight of the Kashmiri and Palestinian people. “Kashmir has become the symbol of the lost conscience of the international community which has repeatedly turned a blind eye to the bloody violence, coercion and suppression that the people of Indian-held Kashmir are facing at the hands of the Indian state. We also need to ask what the divided Muslim world is doing right now for the people of Kashmir and Palestine who are standing alone, and this needs to change. Not only must Pakistan raise its voice, and appoint the special envoy that the Senate of Pakistan asked for on April 17 2018 in a joint resolution, but so must other Muslim countries. We should not pass the blame and put all responsibility on only the western countries, questioned the Senator. The Vice-President of PPPP reiterated the party’s support for the Kashmiri cause, saying, “PPP will always stand by Kashmir. Kashmir is always on our agenda and we will talk about Kashmir on every forum, be it local or international. The world must not allow Indian forces to kill innocent Kashmiris with impunity. My first act as Senator was move a resolution on Kashmir in the Senate, highlighting Indian atrocities in the region, which was unanimously passed by the Upper House and we will continue to raise this issue. We were also the ones who urged the government to appoint a special envoy for Kashmir, but have seen no action on it so far”. “It is particularly disturbing, considering the heinous human rights violations being committed by the Indian government and its armed forces in Kashmir, that it gets no real coverage internationally. The Parliament and media have a responsibility and a pivotal role to play in this conflict. It is to get the stories of Kashmiris out to the world. The world needs to know what is happening in reality, on the ground level,” the Senator added. Criticising the Indian atrocities in Kashmir and the silence of the international community, Rehman said, “Indian democracy breaks a leg when it comes to Kashmir. There is a wall of silence, torture, discrimination and horrible sanctions against the Kashmiri people, who have become one of the most persecuted communities in the world. There are two things here. Firstly, India has managed to contain the real story of the Kashmir issue. Secondly, India has set the narrative. This narrative is one whereby a legitimate political freedom struggle for inalienable rights to self determination has been reframed as a terrorist movement, which is of course convenient to international powers. It is not that they don’t know what is going on. It is about not wanting to know. We need to tell the story of this repression and blatant human rights violations to all international players”. “Kashmir needs to be back on the international agenda. Despite the fact that the international community has been a silent observer on this issue thus far, we look forward to the United Nations waking up to the wishes of the Kashmiris and Palestinians, and decide that they, too, have a right to self determination,” concluded the Senator.